Join the fun when the Little family adopts an adorably spunky boy named Stuart (voiced by Michael J. Fox) who looks a lot like a mouse. Mr. and Mrs. Little (Hugh Laurie and Geena Davis) fall in love with Stuart right away, but their older son, George (Jonathan Lipnicki), isn't so sure. As Stuart tries to win over his new brother with hilarious feats of courage and daring, the family's cat, Snowbell (voiced by Nathan Lane), gets involved.. 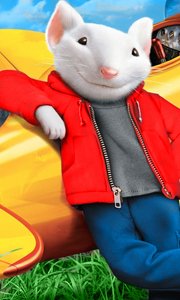 When Stuart Little, an adorable little mouse with a big heart (voiced by Michael J. Fox), is adopted by the Little family as a brother for their son George (Jonathan Lipnicki), he finds he has a lot to adjust to his new home. Whilst Mr and Mrs Little (Hugh Laurie and Geena Davis) fall in love with Stuart right away, George doesn't quite know what to make of his new brother. And when Snowbell the family cat find he's been displaced by a ..
Stuart Little: When Stuart Little, an adorable little mouse with a big heart (voiced by Michael J. Fox), is adopted by the Little family as a brother for their son George (Jonathan Lipnicki), he finds he has a lot to adjust to his new home. Whilst Mr and Mrs Little (Hugh Laurie and Geena Davis) fall in love with Stuart right away, George doesn't quite know what to make of his new brother. And when Snowbell the family cat find he's been ..
Own Stuart Little - The Animated Series DVD from Deff, DVD, Blu-Ray & 4K Video Specialists - Free UK Delivery..
Own Stuart Little - The Complete Animated Series DVD from Deff, DVD, Blu-Ray & 4K Video Specialists - Free UK Delivery..
Plucky, pint-sized hero Stuart Little (voiced by Michael J. Fox) returns in Stuart Little 2, delighting audiences with his big heart and even more action-packed adventure. This time, Stuart embarks on a journey through the city with a reluctant Snowbell (voiced by Nathan Lane) to rescue a new feathered friend, Margalo (voiced by Melanie Griffith), from the clutchless of a menacing Falcon (voiced by James Woods). It's a tall order for a .. Pack your bags and load up the camping gear, it's time to answer Stuart Little 3: Call of the Wild! In this exciting animated adventure, the Littles head into the wilderness when they take a camping trip far from the city. There's just one thing they didn't pack for: the big, bad beast that supposedly lives in the woods! While Stuart learns basic survival skills from a feisty skunk named Reeko, scaredy-cat Snowbell uses street smart all..